Discussion in 'Workshop - DIY - Do it yourself' started by UNiQFashionista, Mar 28, 2009.
so I've been lusting over Balmain shoulders, but the prices are nuts, I do know a good tailor, but we don't speak the same language, and she needs to be instructed.....so, should I use a blazer I already have and just do the shoulders,sleeves etc..or should I start from scratch? I'm interested to see if anyone of you tried and if not, it wont hurt ! I wonder what kind of padding should be used for the shoulders? Do you want the curved lapels and skinny arms as well? In that case, I would get a whole new blazer from scratch. If you've got one already that you like, and fits you well, and don't mind experimenting on, I would take that. I don't think you'll be able to find conventional shoulder pads that will give you the shape you want. I would almost be inclined to have a small brick of foam or something, and carve that into the shape. But again, if it's a good tailor, they should be able to know what material to use to get that curved shoulder shape. yes - please do! Sounds like you should get it all done from scratch to get exactly what you want. I think to make those shoulders you could probably even get a small ball, and cut it in half, and place it in there somehow. I prefer the black blazer to the denim one posted above, because the one above really does look like a ball. Maybe you could take a blazer that is most like the Balmain one (fitted, skinny arms, etc) and she could use that as a 'base' to start on, and copy it from scratch but alter the proportions/shoulders/etc to look more like the Balmain one? yes!!! we need a thread like this! i think finding a tailor that speaks your original language is invaluable. i think starting from scratch might be awfully expensive. does a fancy department store around you carry balmain? if so maybe you can try on one of the balmain jackets and in the privacy of the dressing room take some measurements and photos! Are you guys for real..?? Is it really called a tailor..
And you can make women's and men's clothes with this person? for me, yes. The woman I go to hems clothes, takes things in, etc. but also makes clothes from scratch. I had my highschool graduation dress made by the woman I mentioned as well, off a Reem Acra design that I liked and this way it's all made to measure and you can add and take away things that you like or don't like. but I'm curious about the detailing... The silver work, it could be applique or embroidery--but it must (or should?) be done by hand. And the denim is washed out, you can see the dye is concentrated at the seams... perhaps more handwork. From my own experience the most expensive parts lie in the details Like a special pocket takes a long time... longer than the time I spend making the body of a garment. when doing STUD DIY's , where do you buy the studs, how do they go on etc? can you post a picture? You should be able to buy studs at any local crafts store. If you don't have one nearby, I would just look on ebay to find the studs you are looking for. I know there are several good bead shops in the UK that have an online store. I have often thought the pretty skirt could be easily recreated with a skirt from AA. I guess it depends the type of stud you buy. There are a couple ways you could do it. If you have a bedazzler or something, you could use that. Alternatively, you could individually glue them on. Or, you could glue (with a hot glue gun) them onto a thing strip of ribbon, and then sew that ribbon onto the skirt. That would probably more closely replicate the skirt itself, and it would mean the studs would be in a relatively straight line. "I used the 1/4" pyramid studs from studsandspikes - the backs of the studs have two prongs that you push through the leather and then clamp down on the other side. No glue involved. We did it by hand so it was kind of time consuming, but worth it." Where can I find amazing shoulder pads like that? i found photos and instructions for making a DIY version of balmains studded label blazer from maisondesreveries.com. the first picture is the original. it cost $4200. "What you'll need if you would like a studded lapel blazer of your own. Simple boyfriend blazer. Mine is from H&M. This is not the time to break out the big guns because you are poking irreparable holes into this fabric. Pyramid studs. I used 1/2" ones. You will need 200+ AT LEAST depending on the width of your lapel. A pair of jewelry pliers to bend the backs of the studs. PLEASE don't try to do it with your fingers because you will be bleedin' all over your beautiful masterpiece by the end. Keep studding along in rows and follow the width of the lapel to determine how many studs you can fit on that row. Try to keep them as close to one another as possible. The difficult thing is to keep the studs straight. I found one trick that helps is to look at the back of the lapel and make sure all of the metal prongs are creating one straight line like so in the picture. In case you were wondering, I started off at the middle of one lapel, went all the way down, and then went all the way around the neck towards the other side. Why I did this who knows but it ended up working great and both sides ended up being even. I'd love to stud a jacket like that, but how long would it take and is it really tough to push the studs through?? do you need a gun thing to do it? 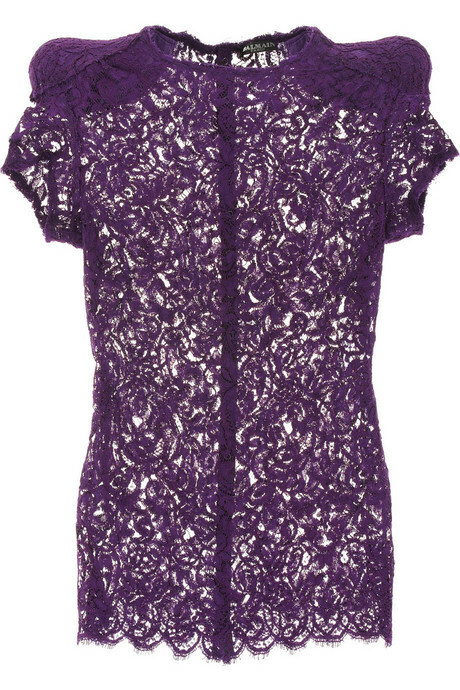 I'm really keen to diy a shirt like this - do you think it would be easiest to buy the lace and take it to a tailor? I think the most difficult would be again, to source the shoulder pads - especially if I try to do it in a crazy coloured lace..